13.1 Miles to Go… | (m)EAT LESS, RUN MORE! To reach my 100 mile running goal for the month, and with only 2 days left – EEK! I wish I would have realized this before only running 1 mile today, Lol! Looks like I’ll be doing my long run on Saturday instead of Sunday this week ;) As long as I get my 3 mile run in tomorrow, I’m confident that I can do it! 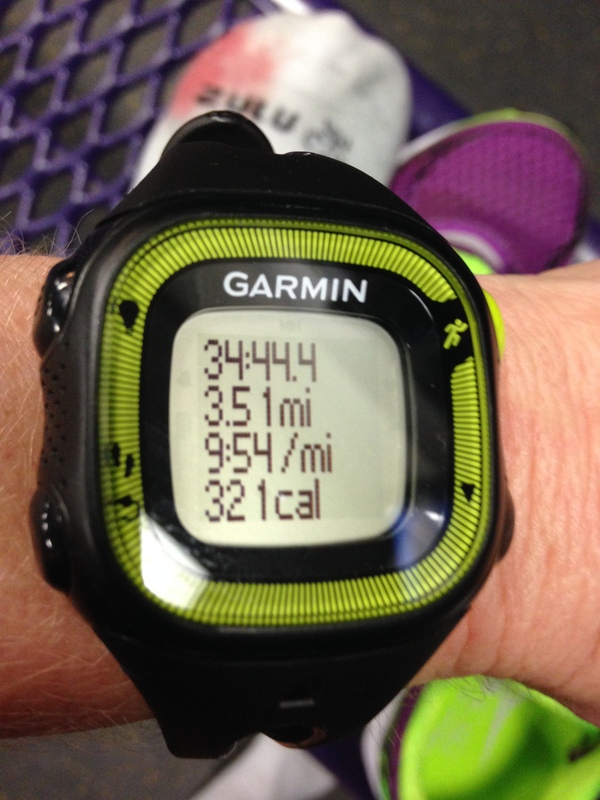 Yesterday I did a test run of the speed-work intervals I’ll be doing when Marathon Training starts (in 11 days!!). 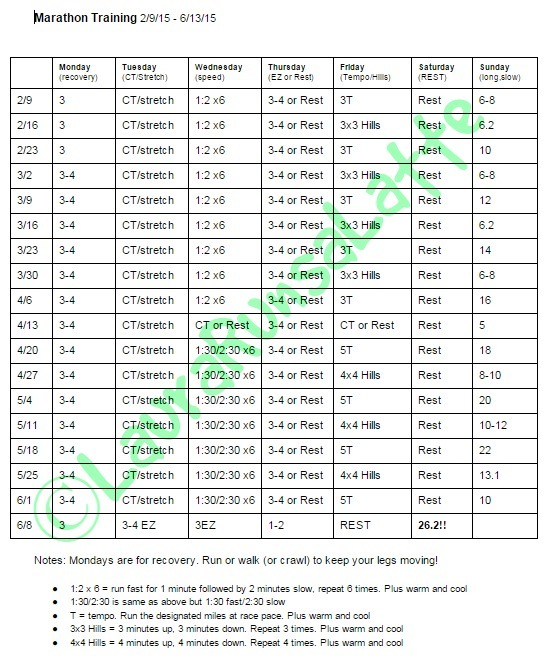 After a 5-minute warm up you do 6 repeats of 1:2 intervals (running hard for 1 minute followed by 2 minutes recovery) and a 5-minute cool down. This equals 28 minutes, which isn’t quite long enough for me *grin* so I did 9 repeats. I can already tell this is going to be my favorite day of the week! As I mentioned above, today was just a 1 mile easy run (plus 1.5 miles walked). Tomorrow I think I’m going to test out the 3×3 hill repeats (running uphill for 3 minutes, then downhill for 3 minutes), continuing the repeats until I make it to (at least) 3 miles. Umm, see my bloody sock in the background? I’m not sure exactly what happened there because at the time, my toe didn’t hurt. Even after taking off my sock and cleaning the blood off my pinky toe, I have no idea what’s going on with it. Today it’s sore, but there’s no mark, bruise, cut or anything that makes any sense as to why all the blood. What?! WHY?! P.S. these are the best socks EVER! I wore different shoes today (Newton Fate) just in case it’s the new Fastwitch’s that caused this, and while there was no blood after today’s run (and remember, it was only 1 mile), my toe was somewhat painful by the time I got back to work. I’ll try to assess more after tomorrow’s run since it will be longer, but I really hope it’s not the new Fastwitch’s. I really like them! Not to mention that the extra 2 pairs I ordered came today… Ugh. Thanks! I know, right?! So weird – wish I knew what happened to it! That is so weird about your toe! Keeping my fingers crossed that it’s not the shoes because I know how excited you are about them! Of course I agree! Do you have a local running store that’s helpful? I think part of the reason I make so many online purchases is that it’s about an hour drive to go to Road Runner, and then the occasions I have made the drive, I end up bankrupting myself in there! Lol! 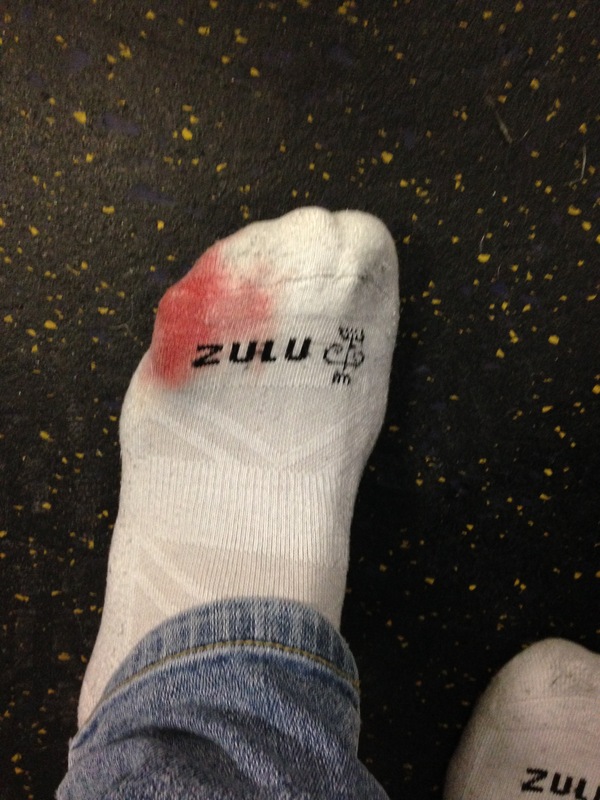 Bloody sock is not good. I hope it’s not the shoes.